Leaving the Bar? Check the Jukebox for Real-Time Subway, Bus, Uber Info. Yes, the Jukebox. No, you’re not hallucinating -- the jukebox in front of you has, in fact, switched from MIA to MTA. 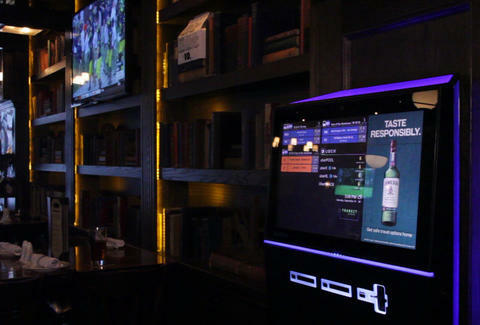 A new free service is now providing real-time transportation info on the screens of digital jukeboxes at more than 50 bars throughout NYC (and other hangouts in major cities across the country). That’s right: before settling your tab for the night, you can saunter over to the jukebox and scope out your ride-home options in much the same way you would scroll through your favorite pop songs. Find out when the nearest subway train or bus is arriving, then compare that to how many available Uber and Lyft cars are trolling the neighborhood -- all on one screen. Should you head out now, or have another drink first? With this data, you can easily make an informed decision (quite possibly, your first of the evening). The program is a partnership between jukebox company TouchTunes and tech startup TransitScreen with the funding of advertisers including your favorite liquor brands. You’re probably wondering: Why would I use the jukebox when I can just search out the same info on my smartphone? “One, it’s just easier,” says Ryan Croft, founder of TransitScreen, which provides similar up-to-the-minute transit intel in the lobbies of various high-end apartment buildings nationwide. Obviously, the jukebox screen is bigger than your phone, “so there’s more information that you can fit on one screen,” Croft says. That added space allows you to survey the bus, subway, and car service situation all in one place. Say it’s raining. Uber is charging surge prices at the three times the usual fee. Why pay $50 to get home when you can clearly see that the closest subway train is four minutes away? Also: “Your phone could be dead by that time of night, or you might not get service in that dive bar,” adds Croft. 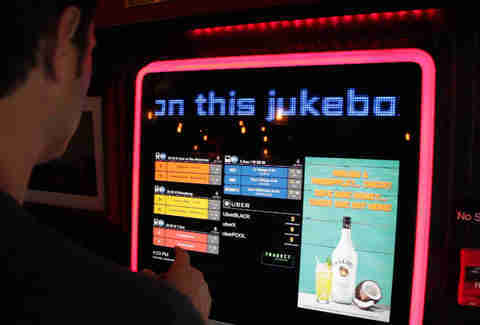 The jukebox is a workable alternative in either case. Thankfully, not every transportation option is available through the new jukebox application, Croft notes. “We do take off Citi Bike and we take off car-sharing from all the bar displays, because if people are drinking, it’s probably not the best idea to hop on a bike -- and we definitely don’t want them to take a car,” he says. Croft’s company aims to ultimately rollout the program to tens of thousands of bars nationwide.